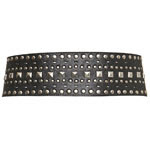 Well, I'm on the hunt later for a black studded belt-this one below is curently on sale at Topshop for £25. Knowing me, I'd rather get something a lot cheaper-I'll be sure to let you know how I get on!! I'm going to check out H&M, Primark, Miss Selfridge, New Look, so hopefully I'll find one! Have a great weekend everybody!! Topshop Leather and Elastic Studded belt, £25-yum yum!! Don't forget to look in Peacocks and New Look. I bought a studded belt 6 years ago in House of Fraser for £35 which was a lot but I loved it and it is so versitile. This year it has come into its own again! hi Sharon! i have a H&M black studded belt, and it's great! it's a simpler style than the topshop one, just like a normal elt, a bit wider, with just square silver studs all over it. fairly successful shopping trip at Primark(! )-a corset belt very similiar to the Topshop one for only £3 and an elastic and faux leather stud one for £2!! I'll update with pictures soon! Hi atelier-the topshop one is great, but save £22 and get the similiar one from Primark!! Wow super finds, I do love Primark. I have a studded belt from H&M, love it, although I wish they were cheaper!